TGIF! Wow, it’s been a whirlwind week for the Tress family, but so fun! I wanted to present you with a giveaway this week for a little fun! Several weeks ago, the hubs and I went to Seattle for a business trip. It was my very first trip away from Baby Cole, and after 11.5 months of breastfeeding, I decided to wean him cold turkey. My goal was to breastfeed him for 12 months, and since I was only 15 days away, I decided we were “close enough.” Prior to weaning him, a great company (Mercola) reached out to me in regard to a review and giveaway of their breast health products. In addition to trying the breast health formula, I reviewed important tips on their site in regard to breast health. Here are some very tangible tips that you can easily implement. Visit the mercola.com site to read more fantastic breast health tips, and to review the Breast Health Formula facts. It is so important to be knowledgeable about this often hushed subject. See below for info on how to win a bottle of the Breast Health Formula. I was also recently contacted by Smile Brilliant. A phenomenal company passionate about helping us have the very best smiles possible. 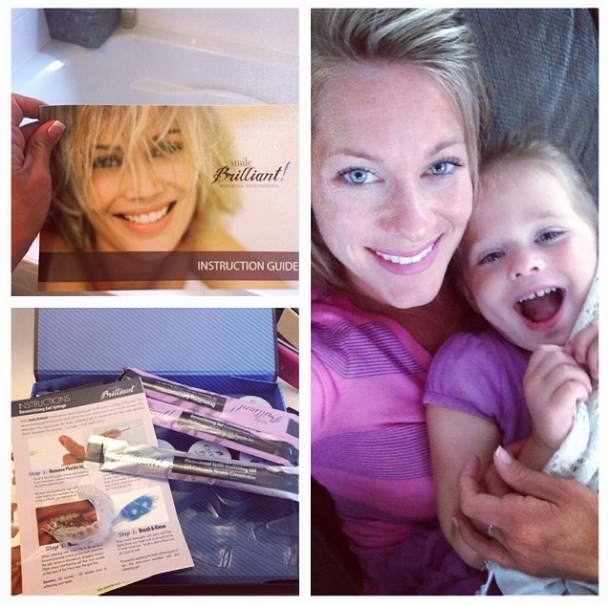 Last week, I reviewed the teeth whitening trays and I want to give a set away to one of you! Smile Brilliant sent me a shipment with trays for impressions. Each whitening kit is set specifically for the client. I did my impressions which only took a few minutes, and sent the trays back. Within a few days, I had my custom teeth whitening kit! Wow — that was fast. The marketing materials, case, brochure, packaging, etc was professional, and it made me very comfortable to use the product. So — did it work? I think YES! I wore the teeth sensitivity gel for about an hour, and then put on the teeth whitening trays. I am a coffee lover, so my teeth tend to get dull and occasionally stained. After wearing the whitening trays for 2 hours, my teeth were sparkly white. I could definitely tell a difference, and so could the hubs. I had a little tooth sensitivity the next day, but it was gone within two days. WOW — this system sure beats the 14 day teeth whitening strips I used to use. Join me as I take my fitness business and mentorship business to the next level! I’d love to win because my teeth could definitely use whitening! Thanks! I follow you on Instagram (and love it)! I also followed Smile Brilliant on Instagram (@pwn3rd)! Since I have become a mommy (almost a year now) I have not taken any time for just myself. I would love to win the Smile Brilliant system to take a little time for myself and remember that I am important, too! I am a busy mom of 3. I drink tons of coffee to try to keep up with the kids, downside, my teeth turn full too! I would love the chance to use this product to help them get whiter! Amanda, I neeeeed the teeth whitening. I’ve always been a coffee drinker, but now I work in a British office with easy and frequent access to tea. With my work mates bringing around cups of tea throughout the day, my teeth have lost their shine and are starting to stain badly. I realized that I am now averaging 4 or 5 cups of coffee or black tea a day. Yikes! So, yes, I will cut back on that number, but I also need some outside help. This sounds perfect! I would love to win this because I am very sensitive about my teeth. I am an avid coffee and tea drinker so it’s hard for my teeth to stay white. I could use the whitening kit because I’ve got my best friends wedding coming up in October and my brother in laws wedding in a few months that I’m reading at! I follow you on Instagram (and Facebook, too)! I follow Smile Brilliant on IG. As an avid (several cups a day) green tea drinker I would LOVE the teeth whitening system. As someone who is looking at getting pregnant your Fit Pregnancy DVD and the breast health supplements would be perfect!! Since I just hit the 1 year mark of successfully breastfed I g my son AND now I’m drinking copious amounts of coffee, this prize pack is much needed by this new mommy! I ended up having to pay out of pocket to get braces at 21 years old (parents could never afford them) because my teeth were so badly out of line my ortho was worried I’d wear out the only four I chewed with and lose them by 40! I took great care of my teeth and they came out of the braces without any calcification. Unfortunately though because I didn’t use whitening toothpaste like I did pre-braces I ended up getting pretty bad coffee stains in between them. I use the whitening strips too but they don’t get between the teeth so I would love to try a product that would! Teeth whitening would leave me ready for my closeup (because I cantstopwontstop drinking coffee on set). so I can get rid of my frown!